No other product has done as much to bring orthodontic treatment into the 21st century as Invisalign has, and we are pleased to offer it to the Dix Hills area. When you opt for treatment with Invisalign, you are choosing a cutting edge approach that produces stunning smiles without any of the inconvenience or headaches of traditional methods. This system uses no metal, no wires, and no brackets. What does this mean for you? It means that the fact that you are straightening your teeth is a secret to the world around you. Invisible to others, the plastic aligners slowly move your teeth into the corrected position. These aligners are designed using 3-D imaging technology to perfectly fit your individual anatomy and they are produced in a series, with each one designed to move your teeth a little bit more. It means fewer visits to the office. As there are no elements on the appliance to be adjusted, we need to see you less frequently. Instead of in-office adjustments like you would require with traditional braces, you simply switch to the next aligner in the series according to the instructions of your doctor. It means less discomfort for you. A large part of what people fear about traditional braces is the awkwardness of having them placed on the teeth. With Invisalign, a non-invasive machine takes images of your mouth and creates the aligners based on this mapping of your anatomy. Plus, as the aligners are made of smooth plastic, there are no metal parts to chafe the inside of your mouth. Finally, it means not having to change your life to fit your treatment. With traditional braces, you have to eliminate certain foods from your diet and learn a brand-new way to brush and floss. This is not the case with Invisalign. As the aligners are removable, you can simply take them out when eating, drinking, brushing, and flossing. If you are in the East Northport area and looking to straighten your teeth with Invisalign, take some time to contact our practice. 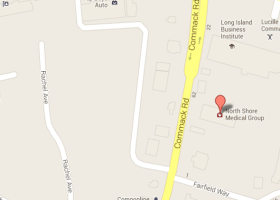 We will schedule your initial consultation at our Commack office and determine if Invisalign is right for you.